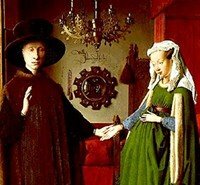 One of the great panel paintings of the Netherlandish Renaissance, filled with fascinating detail and complex symbolism, the Arnolfini Portrait (sometimes called the Arnolfini Marriage/Wedding) is a formal picture of a wealthy couple holding hands in the bedchamber of their Flemish home. It was painted in 1434 by Jan van Eyck (c.1390-1441), who - together with Robert Campin (1380-1444) and Roger van der Weyden (1400-64) - was a key pioneer of Flemish oil painting. The location was Bruges, at the time perhaps the most important trading centre in the powerful Duchy of Burgundy, but the picture gives no indication of the identity of the couple. It was only a century later that an entry in an inventory suggested the double portrait as possibly being that of Giovanni di Nicolao Arnolfini, a prosperous merchant from Lucca, who had an office in Bruges, and his wife Giovanna Cenami, daughter of an Italian banker. This possibility is now considered unlikely. Along with the masterpiece of religious art, the huge polyptych Ghent Altarpiece (1432, Bavo Cathedral), and the self-portrait known as Man in a Red Turban (1433, National Gallery, London), the Arnolfini Portrait exemplifies the contribution of Van Eyck to the naturalism of the Northern Renaissance School, and demonstrates the School's extraordinary mastery of the medium of oil painting. The Arnolfini Portrait provides a clear pictorial record of the rank and social status of the subjects. The woman's robe is trimmed with ermine fur and consists of an inordinate amount of fabric. A personal maid would have been needed to accompany the woman, to hold the garment off the ground. The man is dressed in a plaited straw cap and a velvet cloak, lined with fur. These clothes place the couple among the wealthy citizens of Bruges, though not yet in the top rank. The somewhat restricted size of the chamber, the wooden clogs on the floor worn to protect against street dirt, and the absence of ostentatious gold jewellery, all indicate bourgeois rather than noble status. Nonetheless, the stained glass window, chandelier, ornate mirror and oriental carpet, as well as the groom's well-manicured hands and the expensive oranges on the side dresser, are visible indicators of significant wealth. The convex mirror on the centre of the rear wall, which is exquisitely decorated with miniature medallions illustrating the Crucifixion and other stories from the Passion of Christ, reveals more details of the room. Two visitors standing in the open doorway are visible behind the viewer, as is another window along with the wooden beams of the ceiling. Two centuries later, Velazquez would imitate Van Eyck's mirror in his famous masterpiece called Las Meninas (1656, Prado). In line with the mirror, in the centre of the picture, we see the couple holding hands: at least the man rather formally holds the limp hand of his wife in the palm of his own. The formality of the pose is also illustrated by the man's raised hand - suggesting he is taking an oath - as well as the arranged robe of the woman. Now we understand the significance of the two people in the doorway: they are witnesses to the marriage of Arnolfini and his wife. But there is more to this wedding than meets the eye. To begin with, Arnolfini does not take his wife's hand in his right hand, but in his left. This appears to symbolize what was called a "left-handed marriage" - a union of unequals, in which the woman was obliged to forfeit all the usual rights of property and inheritance: a procedure not unlike that of a modern day morganatic marriage entered into by a European royal Prince and a commoner. Thus it is probable that the two witnesses are present to validate the financial contract drawn up at the time of such a marriage. They were not necessary for the marriage ceremony itself: in 15th century Bruges, neither priest nor witnesses were needed. A couple could marry themselves, and then confirm the arrangement by attending communion together, the next morning. This is also partially confirmed by the odd sight of a single candle burning in the chandelier: the candle symbolizes the ubiquitous Christ whose invisible presence is witness to the marriage vows. Of course, if the couple are in fact Giovanni di Nicolao Arnolfini and his wife Giovanna Cenami, there is no question of it being a marriage between unequals, as Giovanna was equally well connected. But in 1997 it was established that their marriage did not take place until 1447 - some thirteen years after the date of the painting, and six years after Jan Van Eyck's death. However, his brother Michele appears to have made such a marriage in Bruges, around the time of the painting. Other art historians think the painting might represent the wedding of Giovanni di Nicolao Arnolfini and his first wife Costanza Trenta. The woman in the picture is not pregnant: her bulge merely illustrates the contemporary fashion for voluminous robes. Fertility is however alluded to by the wooden carving on the back of a chair, visible underneath the chandelier. The carving, which overlooks the marriage bed, represents St Margaret, the patron saint of childbirth, signalling a wish for a healthy family. To ensure a successful marriage, a dog in included at the couple's feet. This is a symbolic reference to faithfulness. As this simple guide to the Arnolfini Portrait indicates, the iconography and symbolism of this painting is almost endless, and highly complicated. The wooden clogs, for instance, may also be a reference to the quote in the Book of Exodus: "Put off the shoes from thy feet..." signalling the sacred nature of the event occurring in the chamber. The prominence and the unusual form of the signature ("Jan van Eyck was here", instead of the normal "Jan van Eyck did this") is merely one of many unclear elements in the painting. What is clear, however, is that Van Eyck has created a work with considerable religious significance, although one located in an apparently secular situation. Like his other masterpieces, the Arnolfini Portrait had a huge impact on other Northern Renaissance artists as well as Old Masters across southern Europe. It appears that the Arnolfini Portrait fell into English hands during the Napoleonic Wars. Taken to London it was offered to the Crown, who declined it, before eventually being purchased in 1842, for £600, by the then recently-formed National Gallery. Current estimates suggest that the work would be worth well over £100 million if ever sent for auction.  For more about fine art painting, see our main index: Homepage.